Luxbet has some great racing sports and a good range of additional sports to place wagers on. Although I might not offer a good variety of betting options other than moneyline and handicaps, it definitely does not disappoint in terms of gaming experience. An area it could improve on is its banking options but as mentioned earlier, it should not hamper the Australian players. Newbies can definitely appreciate the intuitive website layout and also enjoy the generous bonuses. As far as betting is concerned, betting with Luxbet is surely a good bet. Read the full review of Luxbet bookmaker and know all about the latest bonuses and promotions offered by this top-notch Australian bookie. 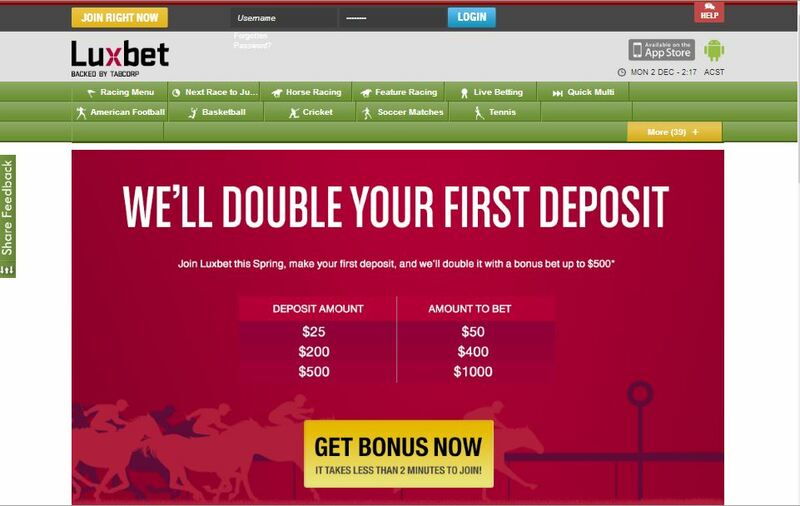 Luxbet kicked off its online betting website in September 2008 and is rapidly becoming one of the preferred betting platforms in Australia. Owned and managed by TABcorp Holding, Melbourne, which is unarguably one of Australia’s leading wagering, racing media and Keno operator, Luxbet is certainly has access to some highly effective marketing tools and are making quick inroads as an Aussie bookmaker for sports betting. Luxbet is licensed under the Northern Territory Racing Commission. After visiting their website luxbet.com, it is very easy to notice how compact and professional the interface really looks. The website for Luxbet (www.luxbet.com) is only available in English language. The homepage of the website is the hub where you can find all upcoming events and sporting events, plus they have sports bet of the day which shows what the most popular odds in the market. A great feature about their navigation is you never leave the home page while placing bets. 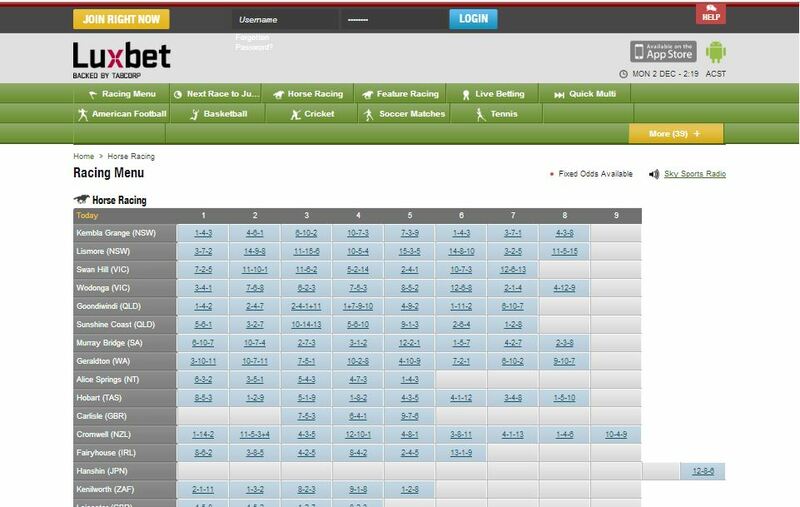 All sports and events punter click will display a dropdown menu without leaving out any buttons on the main page. A downside is that the pages refresh every time sub-markets are viewed. Luxbet has plenty of options for a punter looking for sports betting including everything from the expected to the unexpected. Most punters will find the selection to be more than adequate, although a few niche punters might feel disappointed. Racing definitely takes a big chunk of the featured sports. Luxbet offers horse, harness and greyhound racing across Australia and selected overseas events delivering some of the highest value racing products around. 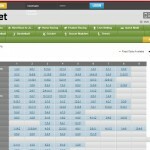 AFL and NRL are heavily catered for, with over 30 betting options on most matches. On top of this, Luxbet does an excellent job offering election betting as well as entertainment betting for shows like Australian Idols or Dancing with the Stars. The only drawback some passionate punters might experience is the lack of pointspreads found in many sports. Luxbet seems to have a good range of sports but relatively lacking on betting options within the sports. However, Luxbet does offer Handicap bets where competitors or teams concede or receive points start. Although Luxbet does not offers many live betting opportunities, it is available on some games, including AFL, basketball, cricket, golf and netball. In-play betting is exciting and with so many options available from half-time bets and Asian handicaps bets, punting can get very interesting. LuxBet also offers a well setup mobile betting site (www.luxbet.mobi) that is easily accessible from any mobile device with internet capability. This means the site is usable from a basic phone or an iPhone or Android device. The site is straightforward which is good in general, however, deposits cannot be made by mobile device and many popular exotic bets are not supported either. LuxBet aims to deliver a luxury online betting experience to its members, which is why apart from just the Internet; the bookmaker also provides phone number through which punters can place bets. The odds format presented in Luxbet are the standard EU odds or decimal odds. One of the biggest advantages of Luxbet is how easy it is to join up but one of the biggest drawbacks would be the lack of banking options that the bookmaker provides. Even though there are limited ways a player can deposit and withdraw, it should not effect Australian players as the options are easily available to Australian account holders. Bank Transfers to Australian accounts are free but there may be small charges to make a bank transfer to any other accounts. 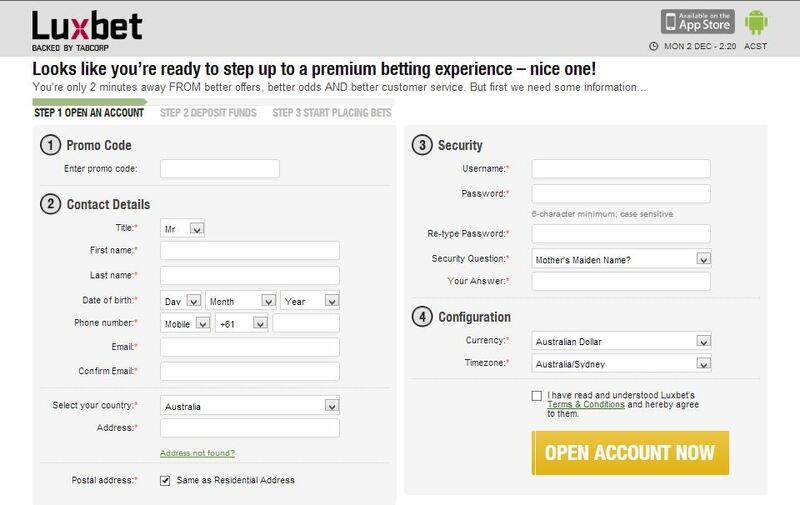 Luxbet is backed by one of the most reputed gaming brand in Australia, TABcorp and licensed under the Northern Territory making then as secure as can be, hence bettors should have no doubt of any discrepancies during deposits or withdrawals. There are great bonuses which appear as valuable option in the Luxbet experience. Luxbet is very progressive when it comes to member promotions and tries to deliver their best when it comes to providing quality to both new and ongoing members. These promotions cover a wide range of sports, which are either moneyback specials or win bonuses. On top of all that, Luxbet runs big competitions as well as some additional great prizes. 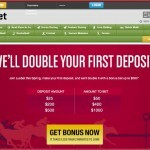 100% match up to $500 bonus on the first deposit. ClubXtra: A premium reward club at LuxBet available for Australian Punters where bettors receive 12% bonus on horse race bets. Weekly specials: Farm Fortune(Horse racing promotions), Maitland Mover (Greyhound racing promotions), Always Albury (Harness Racing), Rosehill Racer (Horse racing), Draw Bonus (Ice Hockey), Half Time Bonus (Soccer). Luxbet, as any other bookmaker, has terms and conditions attached to their bonuses and promotions. Currently on their sign-in bonus, they have a turn over requirement of x1 for bonus up to $250 and x2 for bonuses greater than $250. Wagers with odds more than 1.50 will count towards the turnover requirement. Similarly, other terms and conditions attached can be reviewed in their ‘Terms and Conditions’ page. LuxBet is very customer oriented and because they are so focused on the Australian gambling market, they offer specific customer service hours to cater to this market. Customer service are only limited in the English Language.